Mysuru, Oct. 2- Samskritotsava was celebrated at Vijaya Vittala PU College recently. Renowned Sanskrit Scholar Vid. H.V. Nagaraja Rao inaugurated the programme. In his address, Nagaraja Rao attributed that Sanskrit is a divine language and has its existence from ancient times; it is also the basis of all languages. Sanskrit is not a difficult language as perceived by many. By understanding the principles of grammar, it can be learnt by one and all from all spheres of society. The richness and grandeur of the language is very ancient and there are references of noted scholars who wrote in the court of King Vikramaditya, who was a Sanskrit scholar himself. Noted scholar by name Gangadevi had written much poetry in Sanskrit. The language stands as a symbol of Unity in India due to its origin from this land and is widely appreciated in many parts of the world. Vid. 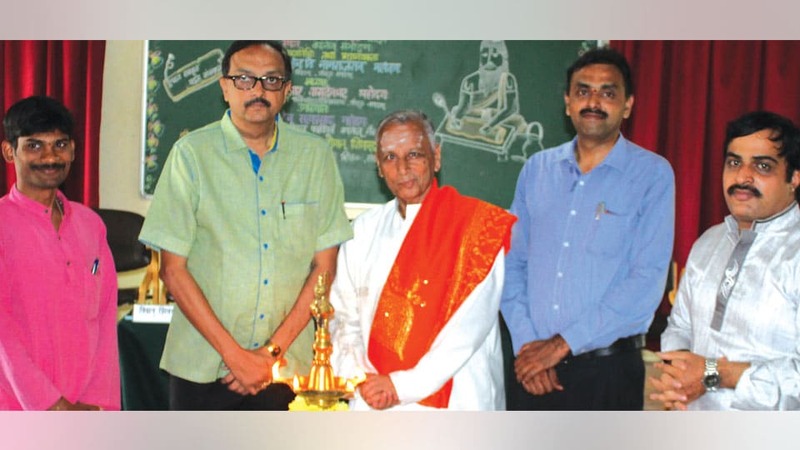 Shivarudraiah, Professor of Sanskrit from Samskrita Bharati, told that it is the duty of all of us to preserve and conserve Sanskrit language. He also advised the students to take interest in learning the language to enrich its knowledge and tradition. Prizes were distributed to the winners of Sanskrit elocution and quiz competitions previously held at Sanskrit workshop. P. Pallavi compered. Meghana and group invoked. Nagashree welcomed. H.P. Bharthwaju proposed a vote of thanks.